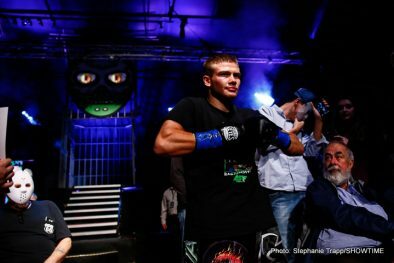 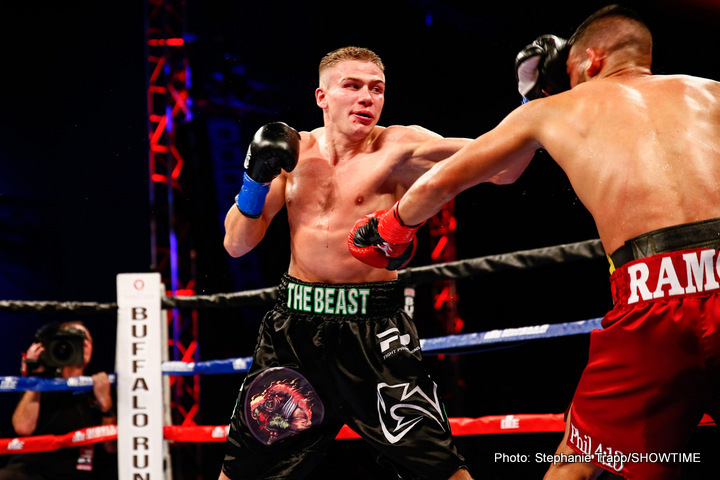 Undefeated super lightweight powerhouse Ivan Baranchyk and a game Abel Ramos brawled in an absolute slugfest that featured three knockdowns in the main event of ShoBox: The New Generation Friday on SHOWTIME, with local favorite Baranchyk winning a 10-round unanimous decision at Buffalo Run Casino & Resort. 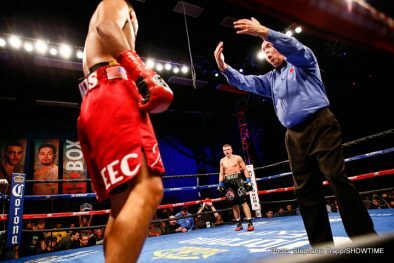 The back-and-forth firefight was much closer than the judges’ scorecard indicated. 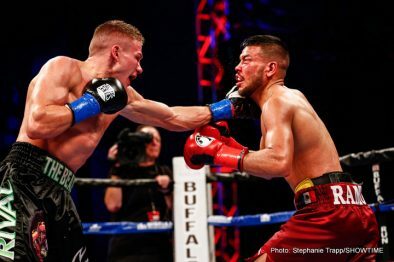 And while the fight was scored wide – 97-92, 99-91, 97-93 – the two-way war is still perhaps an early contender for Fight of the Year. Ramos (17-2-2, 12 KOs) raced to an early statistical lead with a razor-sharp jab in the first two rounds that kept the hard-charging Baranchyk at bay until a sensation third in which the fighters traded knockdowns. 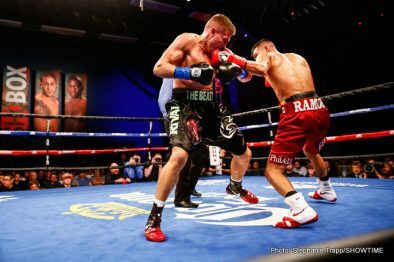 Baranchyk (14-0, 10 KOs) floored Ramos with a flush overhand right with one minute left in the third, then Ramos responded and dropped the local favorite just seconds later with a counter shot in the final seconds. 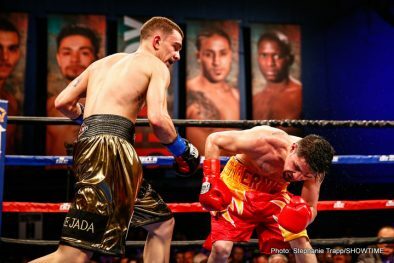 The back-and-forth action continued in the fourth. 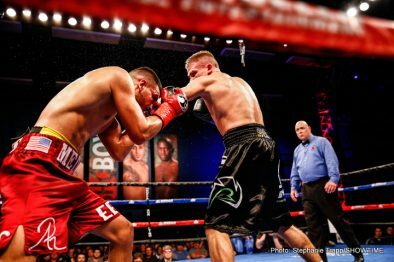 Ramos appeared to have Baranchyk hurt after a series of body shots, but the Belarus-native floored Ramos again with a left hook to the head. 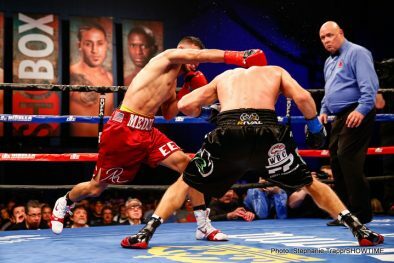 Ramos got up, but the round was scored 10-8. 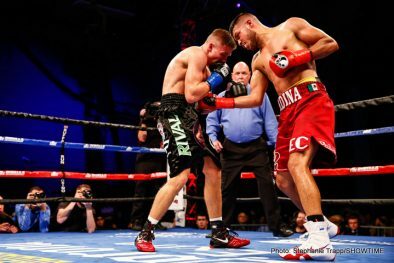 Both fighters traded blows toe-to-toe in an unbelievable sixth round, and then the power shootout appeared to shift tides in the second half of the fight. 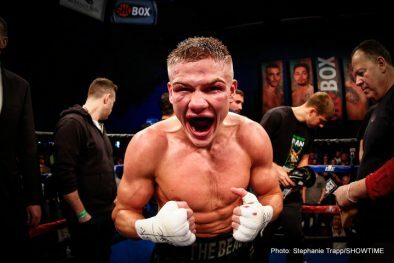 Baranchyk’s superb conditioning was evident as the fight progressed and he battered Ramos, who soldiered on with a bloody and battered face until the closing bell. 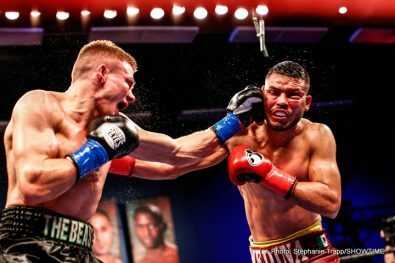 Both Baranchyk and Ramos landed over 50 percent of their power shots, an astounding number for a 10-round fight. 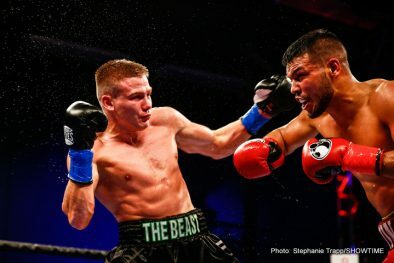 “I think my conditioning and the experience of going 10 rounds in my last two fights was the difference in the second half of the fight,” Baranchyk said. 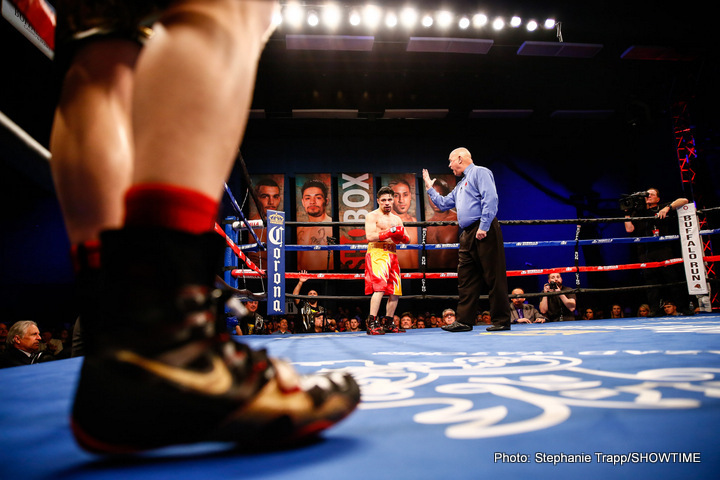 “I was surprised he could take it, but I knew he was a tough fighter. 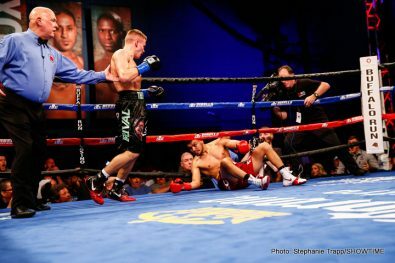 I took a little too much punishment, but I’m happy that the fans enjoyed the fight. 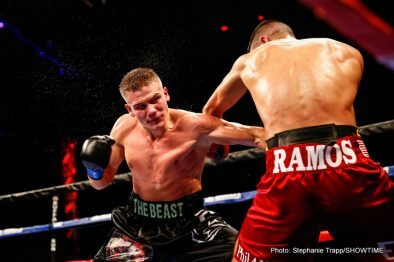 Ramos’ frequent but lighter punches enabled him to retain his statistical leads for the fight (350-314 overall punches landed and more than double his opponent in jabs), but Baranchyk’s heavier shots in the second half were the difference. 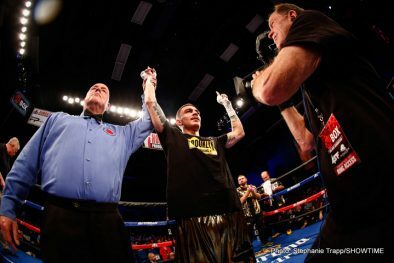 “I thought it was much closer than the judges had it, but it was a great fight all-around,” Ramos said. 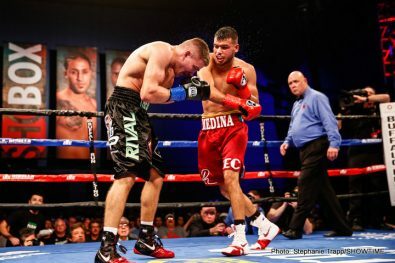 “He kept coming in and pressuring me. 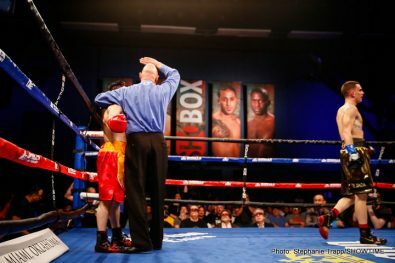 I didn’t tire, but I couldn’t keep him off me. 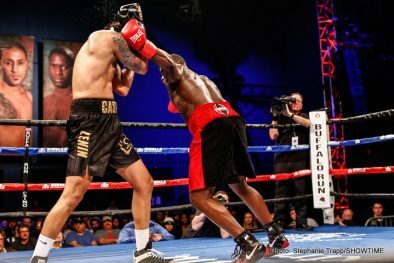 In the co-feature, undefeated light heavyweight prospect Joseph“Mack” Williams won a close, majority decision over previously undefeated Dominican Olympian Lenin Castillo, scored 76-76, 78-74 Williams, 77-75 Williams. 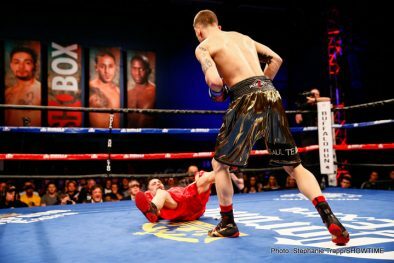 The fight was hard to score from the opening bell. 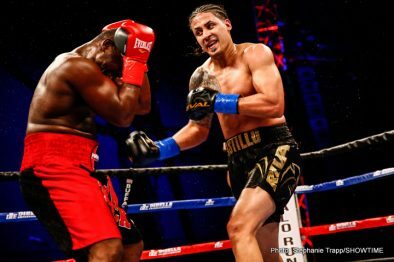 Williams (11-0, 7 KOs) was the busier fighter – he threw 373 total punches compared to just 280 for Castillo – and was more effective on the inside against his taller opponent. 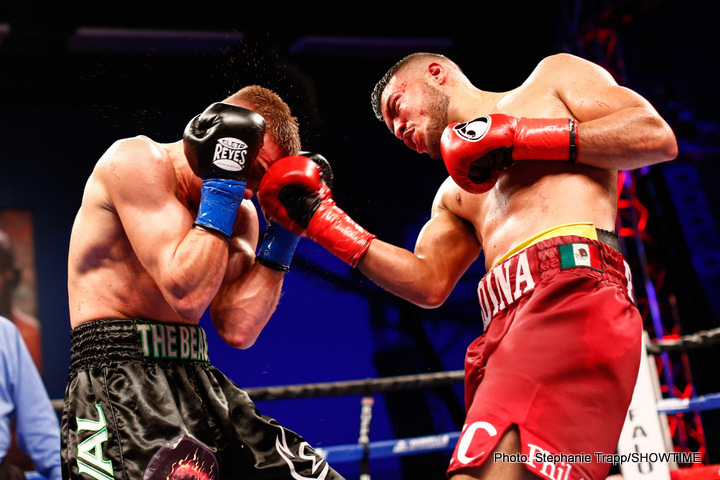 Castillo dictated range with his long jab in the first three rounds, but Williams closed the gap and landed the consistently harder shots in the trenches, where Castillo spent much of the time clinching instead of punching. 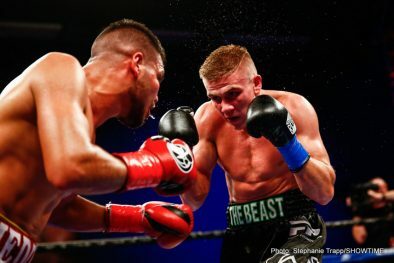 Castillo (15-1-1, 10 KOs) landed 19 jabs in the first three rounds, but only six in the final five rounds, including none in the eighth and final round. 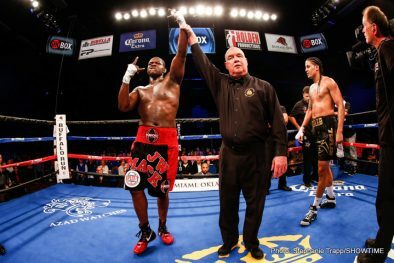 The fight was almost even statistically through five rounds, but Williams’ surge in the final three rounds enabled him to capture the deserved majority decision. 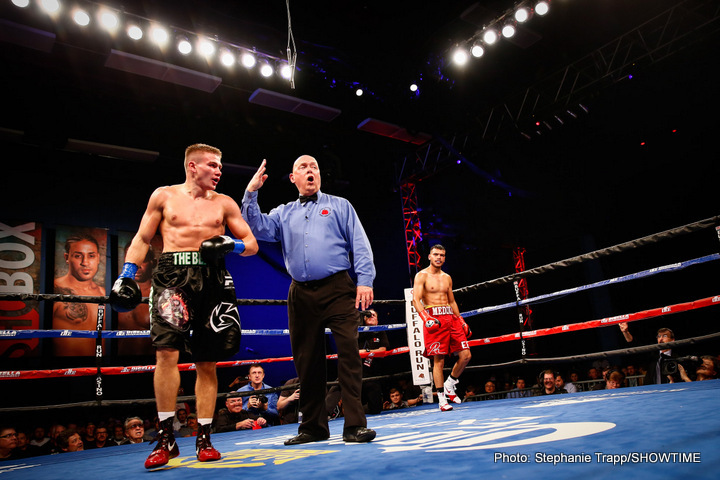 After the fight, Castillo was frustrated but didn’t protest the judges’ decision. 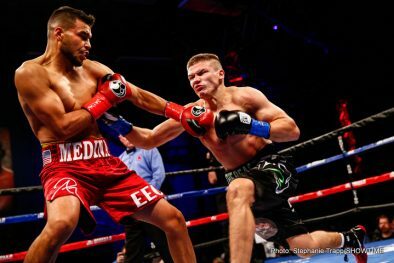 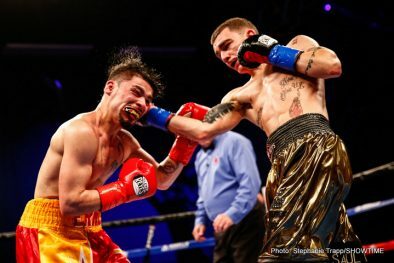 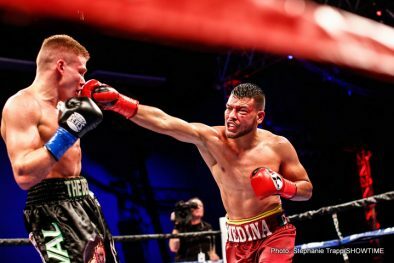 In the opening bout of the telecast, undefeated Spanish super featherweight prospect Jon “Johnfer” Fernadez knocked out formerly once-beaten Ernesto Garza with a punishing series of unanswered combinations in the third round. 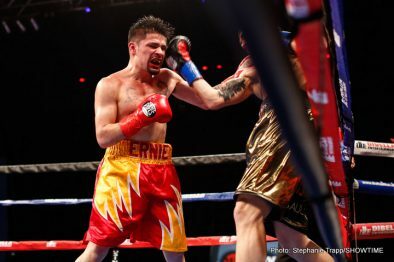 Fernandez was more accurate from the opening bell, buckling Garza a big straight right and flooring him with a series of shots midway through the first. 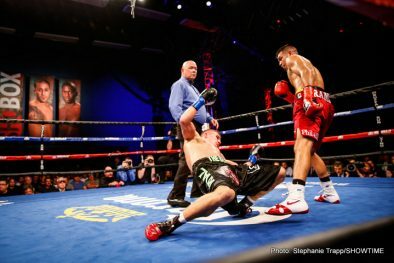 Garza survived the round, but was eating punches and his taller opponent was landing at will. 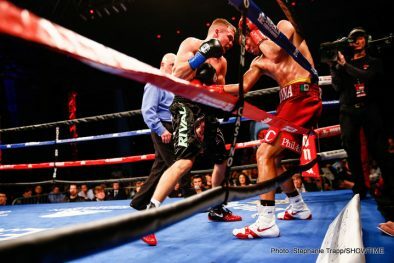 Garza continued to press forward in the second, and both fighters threw over 200 punches through the first two rounds. 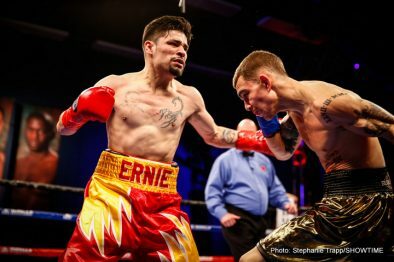 Fernandez opened up the third with a series of damaging combos, and Garza showed tremendous heart to just stay on his feet. 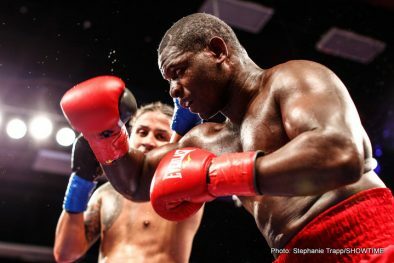 But the southpaw was ultimately taking too much punishment, unsteady on his legs and swinging wildly, forcing referee Gary Ritter to stop the bout at 1:39 (TKO). 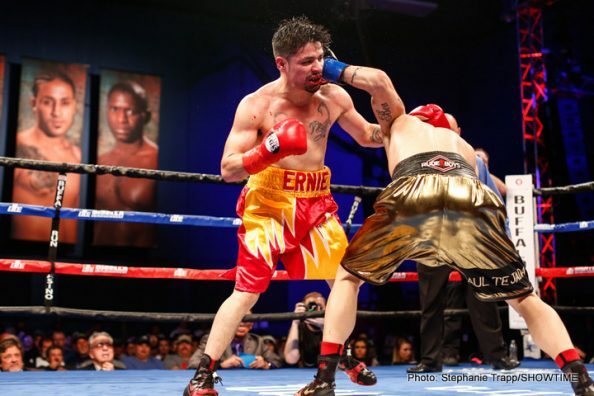 Fernandez (11-0, 9 KOs) threw over 106 punches per round while Garza (7-2, 4 KOs) threw an average of 99, but Fernandez’s power punching accuracy (52 percent) was the difference as he eventually broke down his opponent. 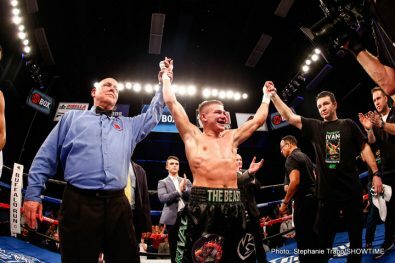 A frustrated Garza, who weighed-in at just 126 pounds for the 130-pound bout, thought it was a premature stoppage. 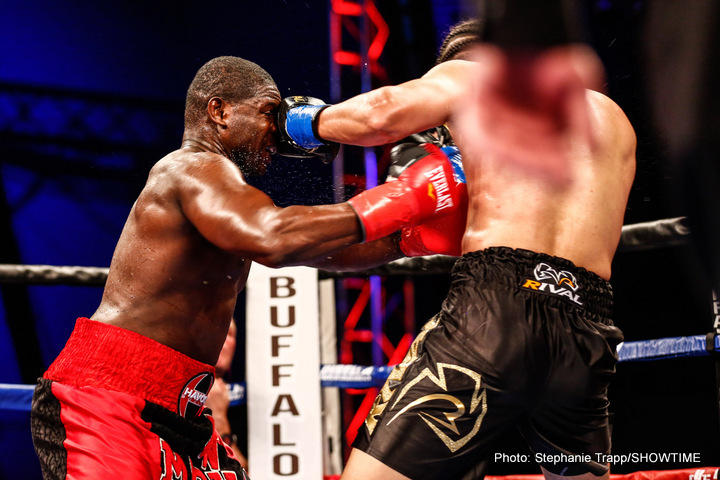 Friday’s tripleheader will replay on Monday, Feb. 13 at 10 p.m. ET/PT on SHOWTIME EXTREME. 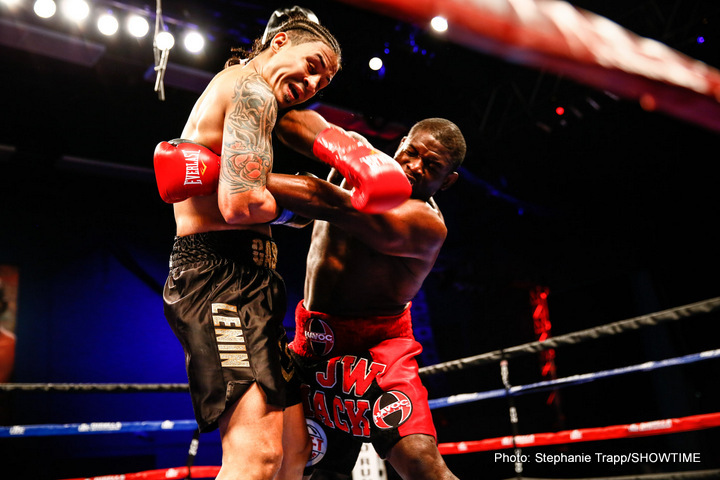 The telecast will also be available on SHOWTIME on DEMAND® and SHOWTIME ANYTIME®. 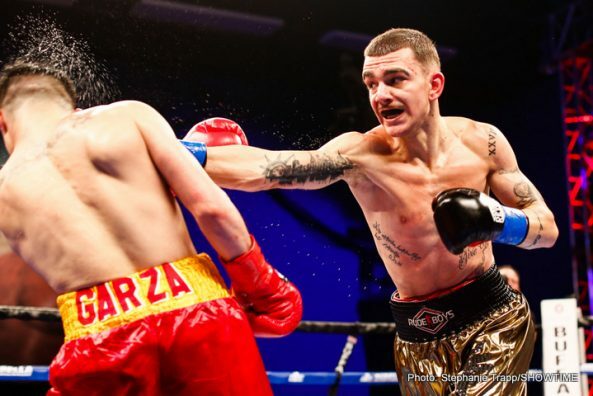 The event was promoted by DiBella Entertainment and Tony Holden Productions in association with Fight Promotions. 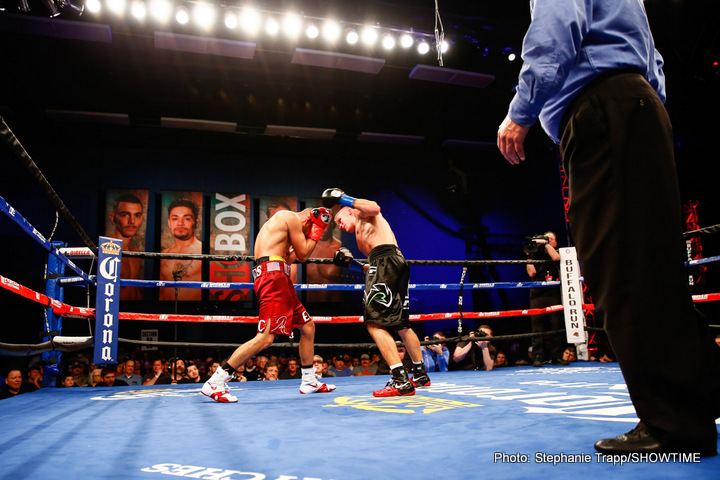 Fernandez vs. Garza was promoted in association with MaravillaBox Promotions and Jaafar Promotions.